It’s rather easy to create a shortcut to a certain OneNote notebook, section or page. But it needs a trick to add that link as a tile to the Windows 10 start menu. Here’s how you do it. By default, OneNote will always start showing you the page that you had opened when leaving the program the last time. This is the same for the desktop version (e.g. OneNote 2016) and the Windows 10 UWP app. Both OneNote clients also allow you to create a link to a notebook, section or page that you can use to create a desktop shortcut. Opening this will always make OneNote load and display that very location at startup. 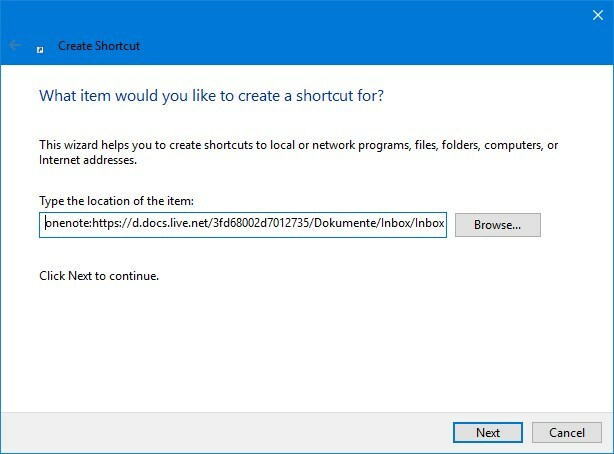 While it seems natural, that instead of placing that shortcut on the Windows desktop but as a tile in the Windows 10 start menu, this is not as easy as one would think. 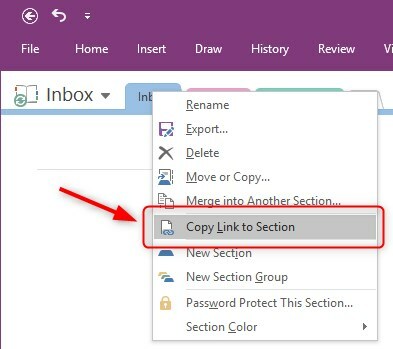 In OneNote (either OneNote 2016 or the Windows 10 app) open the notebook, section and/or page you want to link to and right-click the name of the notebook, section or page in the corresponding list. From the context menu click on Copy link to notebook (or section or page). This puts the link into the clipboard. If your notebook is stored on a local device you may proceed with step #5. If it’s located on OneDrive or Onedrive for business, open a text editor (e.g. Windows Notepad) and paste the clipboard content into it. You should see two rather long URLs (links) now. One starts with “https://“, the other with “onenote:“. Select only that second URL and copy it to the clipboard ([Ctrl]+[C]). Close the editor. You don’t have to save the file. On the Windows desktop create a new shortcut. Paste the URL from the clipboard to the field Type the location of the item. Start the Windows Explorer and navigate to: C:\ProgramData\Microsoft\Windows\Start Menu\Programs. Note: ProgramData is a hidden folder. You might need to make it visible first in the Explorer (check View – Hidden Items). If not every user of this PC but only the one that is currently logged in shall get the shortcut in the Start menu, use the following folder instead: C:\Users\<name>\AppData\Roaming\Microsoft\Windows\Start Menu\Programs. Now copy or move the shortcut you created before from the desktop to this folder. You’ll need administrator rights for this step. Open the Windows Start menu and locate the new shortcut in the list of programs. Right-click the entry and select Pin to Start. Done. You may now move or resize the new tile in the Start menu at will. 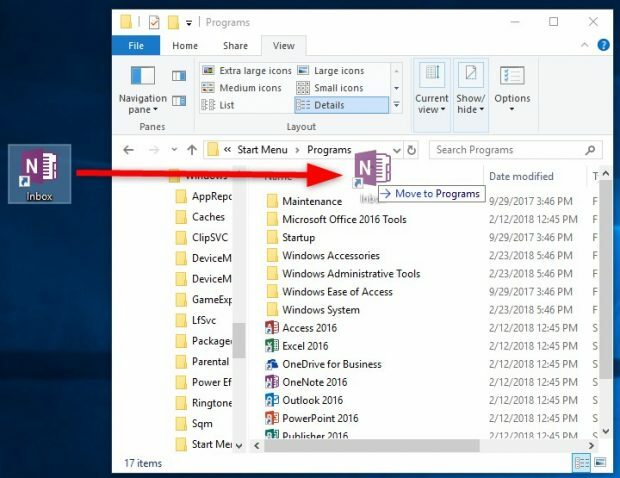 Now you can left-click on the Onenote icon in the taskbar and select the page/section you want and Onenote will start (or maximize) with that page/section open.